A collection of polished stone axes from a late Neolithic site and an Early Bronze Age hill fort in South Tyrol (Italy) have been analysed through a multi-analytical approach, mainly based on non-destructive techniques (i.e. Raman spectroscopy, X-ray fluorescence and prompt gamma activation analysis) to identify the raw materials used in the same area during different periods and compare them with those in use in the surrounding territories. The analytical results suggest raw material exploitation strategies based on local or close sedimentary, metamorphic and magmatic rocks. Most of the artefacts are made from antigoritic serpentinite, whose origin is probably from Hohe Tauern (Austria) or related secondary deposits. 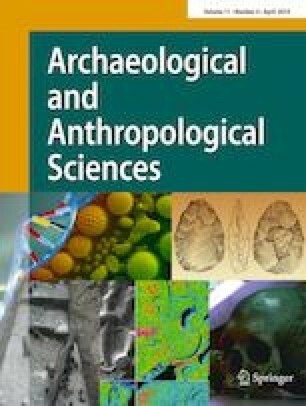 These data confirm the importance of such raw material for the production of polished stone axes during recent prehistory and integrate the present knowledge about the distribution of antigoritic artefacts in north-eastern Italy and neighbouring countries. The authors are grateful to M. Di Giovannantonio for reviewing the draft and to Gianni Santuari, Laboratorio fotografico e di restauro dell’Ufficio Beni archeologici di Bolzano, for the pictures of the axes.